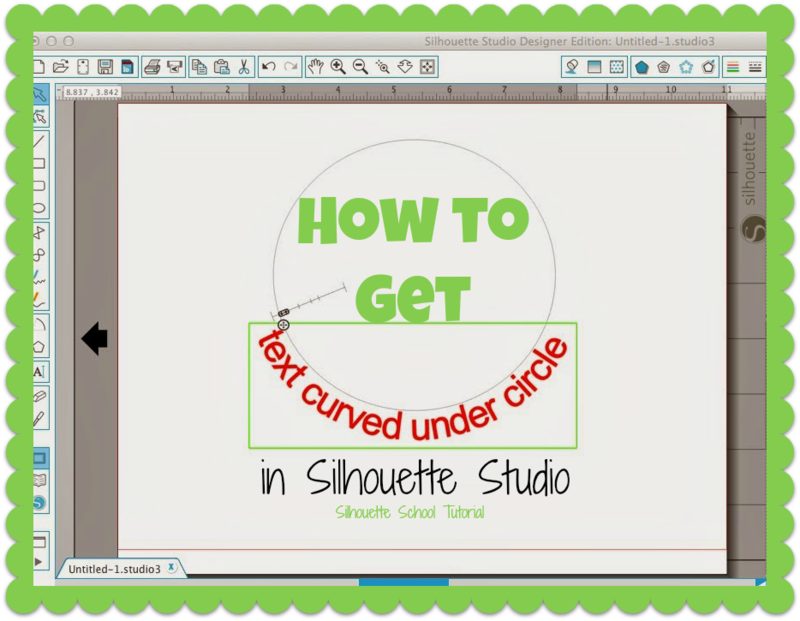 So you've figured out how to put curve around a circle (aka text to path) in Silhouette Studio...but you want it under the circle and, let me guess...this is what you're getting? Or this? Well, that ain't no good. Lucky for you, there is a quick and easy fix. What you want to do is type out your text. Double click the text so you get the green box around it with the little directional arrow circle in the lower left corner. Grab that arrow icon and drag it over to the bottom of your circle. But, but, but it's all squished and on the inside of the circle. FEAR NOT. See how you have that little slider bar on the left side? Click on the gray oval in the middle and slide it down, towards the outside of the circle, until the curved text moves under the circle. If your letters are spaced too far apart now, select the text again and use the character spacing slider bar to bring them closer together. Then grab the circle arrow icon again and move the text so it's centered under the circle. The final step is to right click on the text and select 'Convert to Path'. 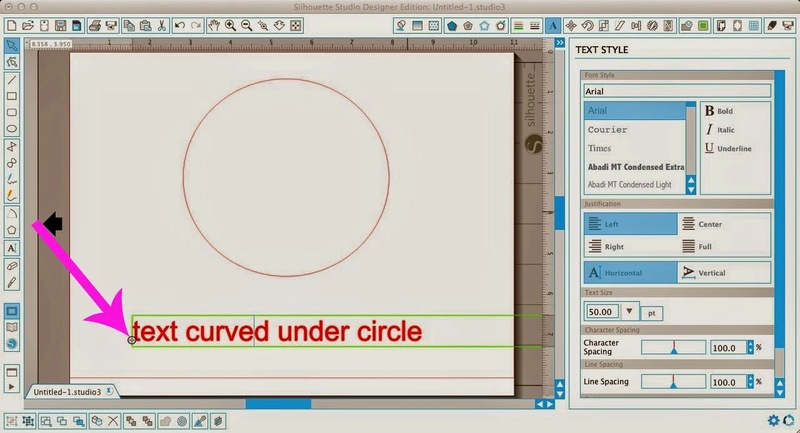 This allows you to move the text away from the circle while keeping it in the curved shape. 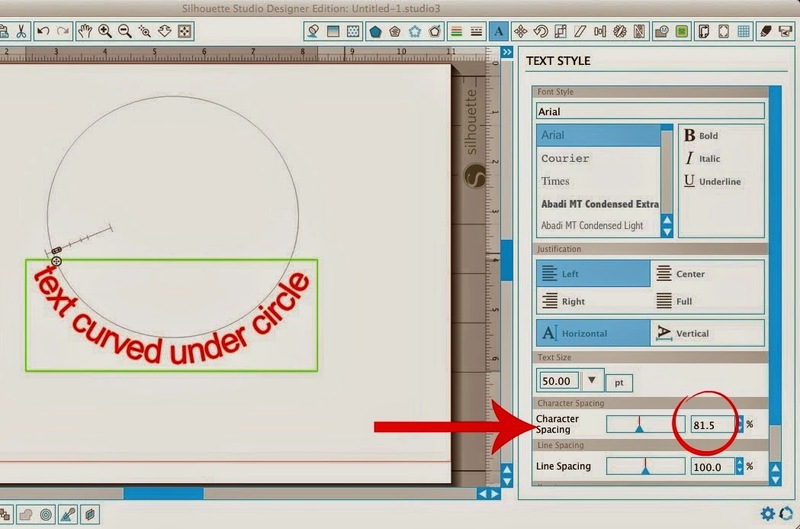 And that's all there is to curving text under a circle in Silhouette Studio. Yes that little slider bar can be a real pain to find sometimes! I still could not get it to work. If I enlarge the text box and the circle like Holly suggested the slide bar still stays super tiny and outside the text box and even more impossible to select it. Thanks for the tutorial and comment. I was having the exact same problem, I can't use the slide bar. I will try this and see if it works. Great tutorial but my text is upside down when I drag it onto the circle. Is there a way to fix that before following the next steps? Is there any trick to the slide bar? Sometimes it will work and other times it just won't no matter how much I fiddle with it! How would you get this to cut correctly if you were using heat transfer vinyl? ONE tip?? Ha ha ha! Many tips and lessons. But at the top of my list is that you said. there was so much to learn, don't get discouraged. Best tip for everyone! I just have to say - I have been messing with this slider bar for HOURS - over a couple days. My frustration level was beyond anything I have ever done with the Silhouette. I just kept deselecting the text box. This clarification...changed everything. Thank you SOOOOOO much. I am so glad I read the comments on this tutorial. THANK YOU THANK YOU THANK YOU. Yes, Mike Brooke is correct! I had the same problem and couldn't figure it out. To expand on the above comment, if you go right where the green text box and slider bar intersect, your curser should change to a cross with arrows. At that point, you can slide as needed. You are a lifesaver. I was almost in tears. Thankful for yours and the above comments. To elaborate even more - when I was on the text box, I had to make sure I was using the "edit points" arrow and not the "select" arrow. That was when the curser changed to a cross with arrows for me on the overlap of the green text box and slider bar intersection. Thank you. Thank you. THANK YOU! I have a question! 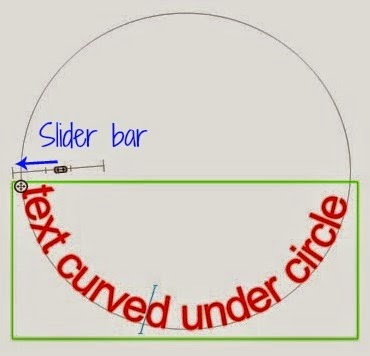 How can I make it so the top of the text curves around the inside of a circle? I cannot get this to work. I have tried clicking everywhere and I'm not having any luck! I cannot get this to work. I have tried clicking everywhere and no luck! it wont work for me :( i've tried edit points i've tried zooming in i've tried EVERYTHING i'm in tears! !